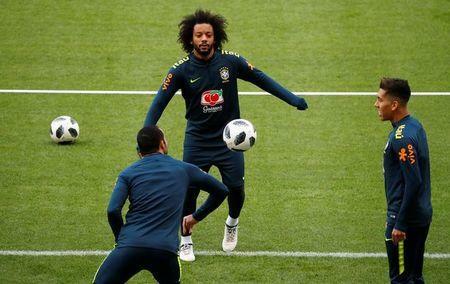 (Reuters) - The eight-year-old son of Brazil left back Marcelo has gone viral on social media with the help of his dad's Real Madrid team mates and an already prodigious talent for heading the football. In a video Marcelo posted on Instagram on Tuesday which has already been viewed more than four million times, Enzo Vieira exchanges headers with a line of 11 Real players, including his father, sitting on a dressing room bench. The youngster, who represents the Spanish club at a junior level, concludes the display by exchanging lofted headers with standing club captain Sergio Ramos before steering the ball into a nearby laundry bin. The Real players, who face Liverpool in the Champions League final on May 26, explode in delight at the successful completion of the feat and mob the schoolboy, hoisting him into the air. "Daddy's pride," Marcelo wrote next to the video on https://www.instagram.com/marcelotwelve/?hl=en. "This is a family @realmadrid."